Kitty Hawk, a startup backed by Google co-founder Larry Page, has demonstrated a prototype flying car that could be one of the first to ship, assuming it meets a late 2017 target. The prototype —known as the Kitty Hawk Flyer —was recently flown over a lake roughly 100 miles north of San Francisco, the New York Times said on Monday. 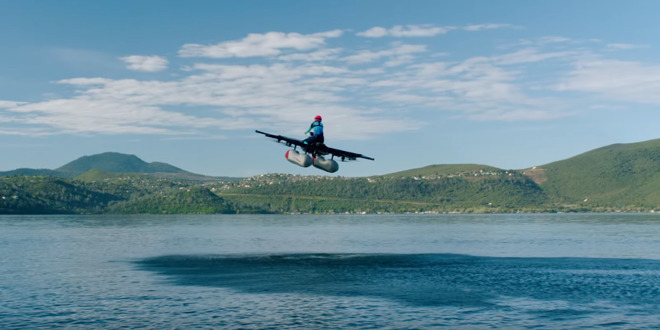 The all-electric vehicle seats a single person over eight propellers, and includes pontoons for water landings. In its demo flight the vehicle reportedly "howled as loudly as a speedboat" while it circled 15 feet over the water for about five minutes. Kitty Hawk is actually working on several other prototypes as well, and charging $100 for an early-access program that will include a $2,000 discount on the final Flyer, plus chances to see or ride the vehicle ahead of time. The company is currently operating under a Federal Aviation Administration category for ultralights that doesn't require a pilot's license, and enables flying in low-traffic areas. For safety purposes, testing has so far taken place over water —Kitty Hawk is promising that the finished product will look different and run substantially quieter. The concept of a flying car has been toyed with for decades, but in recent years a number of firms —among them giants like Airbus and Uber —have suddenly leapt onboard. Uber is in fact due to reveal its "vision for the future of Urban Air Mobility" at a Tuesday summit in Dallas, discussing its Elevate project and "a path towards initial urban eVTOL [electric vertical takeoff and landing] operations." Flying cars have become more plausible thanks to advances in battery technology and automated drones, but rechargeable power still lacks the efficiency needed for long flights, and there are many safety and logistical issues such as where to land, how to keep track of so many low-flying vehicles, and how to prevent mid-air collisions and breakdowns. Apple, Uber, Google sibling Waymo, and many other tech firms are meanwhile working on self-driving land vehicles. Apple recently secured a California permit to test three modified 2015 Lexus RX450h SUVs, though it's still uncertain whether Apple will stick to developing a self-driving platform or resume designing a complete vehicle —a decision could be made later this year.